At Barnes & Noble College, we’re honored to support student veterans at 1,495 physical and virtual bookstores across the country. We’re also very proud of the military men and women who are employed with our company. 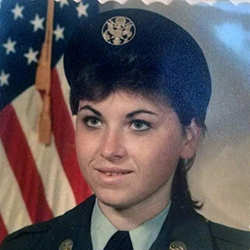 In honor of Veterans Day, we’re thanking Angela Miller for her — and her family’s service to our country. Her resume reveals a wide variety of experiences all over the world, but there’s one theme she’s carried throughout her life: a long family tradition and commitment to serve. And while University of South Dakota (USD) students know her as the manager of their campus bookstore, student veterans know her as one of their own. Angela Miller (nee Tronson) Basic Training, Fort Jackson, SC. August 1986. Miller’s route to the USD campus began 17 years ago, when her husband acepted a teaching position with the University’s ROTC program. She took a part-time job at the campus bookstore, and for the past 11 years, she has been its manager. In 2004, her husband retired from the Army after a 24-year career as a Green Beret and now serves as the veterans’ representative for the South Dakota Department of Labor & Regulation. 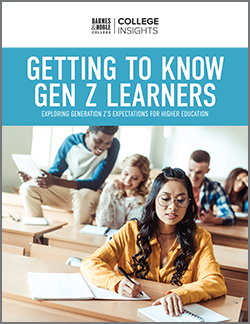 Federal data show 1.1 million military and veteran students were attending college in 2012, the most recent year reported by the U.S. Department of Education’s National Center for Education Statistics. 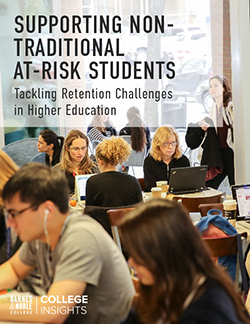 For many of these non-traditional students, facing the dual challenge of transitioning out of military life and into academic life can be challenging. Ranked among the top four-year colleges nationally for military veterans, according to the Military Times’ 2016 Best for Vets list, the University of South Dakota provides the Student Veterans Resource Center (SVRC), a department exclusively dedicated to supporting veterans, current military, military spouses and their dependents. Enlisting in the Army as a teenager, Miller never imagined she would someday be managing a campus bookstore, but she wouldn’t have it any other way. When asked about her career, Miller focuses less on herself and more on the students and servicemen and women she connects with on campus every day. “This is a wonderful university and USD does such an incredible job of supporting our students who have served or who are currently serving in the military,” she says. I am very proud of this lady. She has worked her way up from school all the way to here. She is my oldies Child and my oldies Daughter. I know how hard she has worked in her job and her family. Thank you Angela, Stan, AJ, Tim , Kris and my Husband Donald for your service to this country. Thank you for sharing, Lena, and we couldn’t agree more. Angela is a valued member of the Barnes & Noble College and USD families – and her service to our country, as well as that of her family’s, commands great respect. We’re both honored and proud to tell her story.